The dandelion. A plant considered to be a weed by many has in recent years regained some popularity, and is slowly making a come back in the cooking scene. 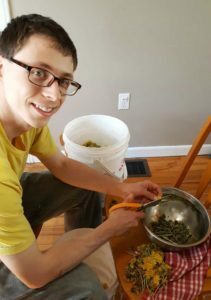 From making homemade dandelion syrup, wine, tea and more, dandelions provide a versatile wild food source, that anyone can take advantage of. Originally brought to North America by the Europeans (perhaps on the Mayflower!?) 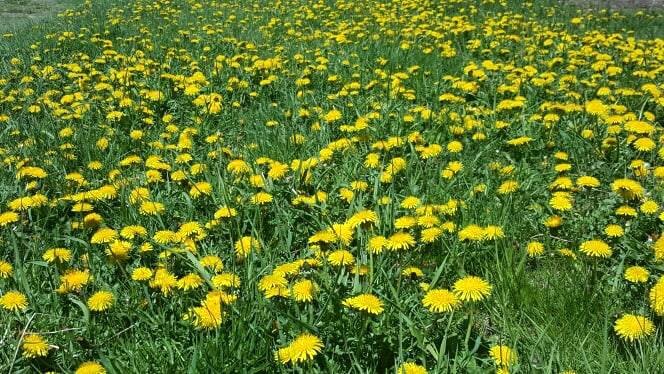 for use as a medicinal herb and food source, dandelions, have since flourished and become naturalized in much of Canada, and the United States. An Important food source for bees and other pollinating insects, dandelions are one of the first flowers to make an appearance after winter and along with fiddleheads an easy to forage Spring edible . This gives us the chance to take advantage of this hardy little flower, and create some delicious food either from, or including various parts of the plant. What Parts Of The Dandelion Can I Eat? All parts of the dandelion are edible. The mature bright yellow flower heads make a deliciously floral syrup as well as wine, and even jelly. 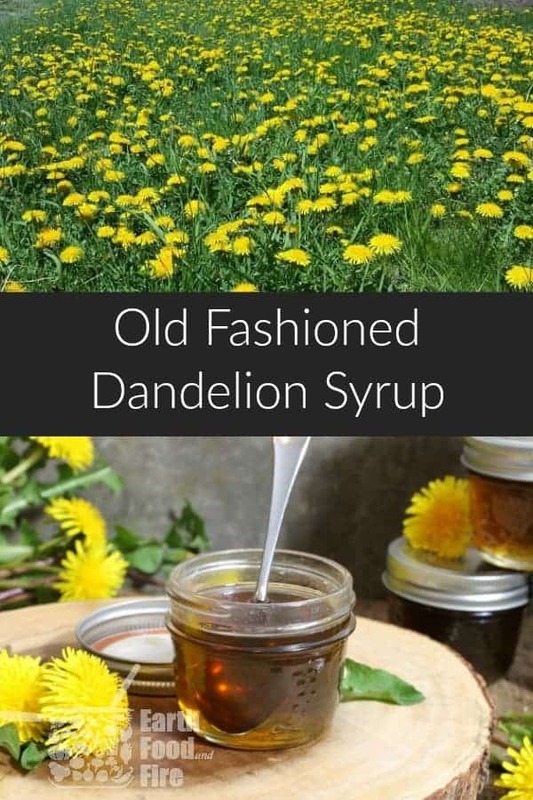 The dandelion syrup can be used as a substitute for maple syrup on pancakes, and waffles, it can be used to sweeten tea and coffee, and even used to bake with! The leaves can be eaten raw or cooked and used the same way spinach and kale are used. The stem while edible, is bitter and not very palatable. The root of the dandelion can be dried and made into a delicious tea, used to treat infections, bile and liver problems, and is traditionally used as a diuretic. The green leaves are a great source of vitamins and minerals, and are particularly high in Vitamin A, C, and K. The leaves when eaten raw in salads also provide a good natural source of Calcium, Iron, and Manganese. As dandelions are pretty comment throughout north America, it’s not at all hard to find a patch of mature flowering dandelions to use in your kitchen. Other recipes you may find online call for 200 or so heads of dandelions, but who in their right mind is going to count them! I also found that this amount will only yield a small batch of syrup, and it’s best to make a large batch to really get a return for your efforts. 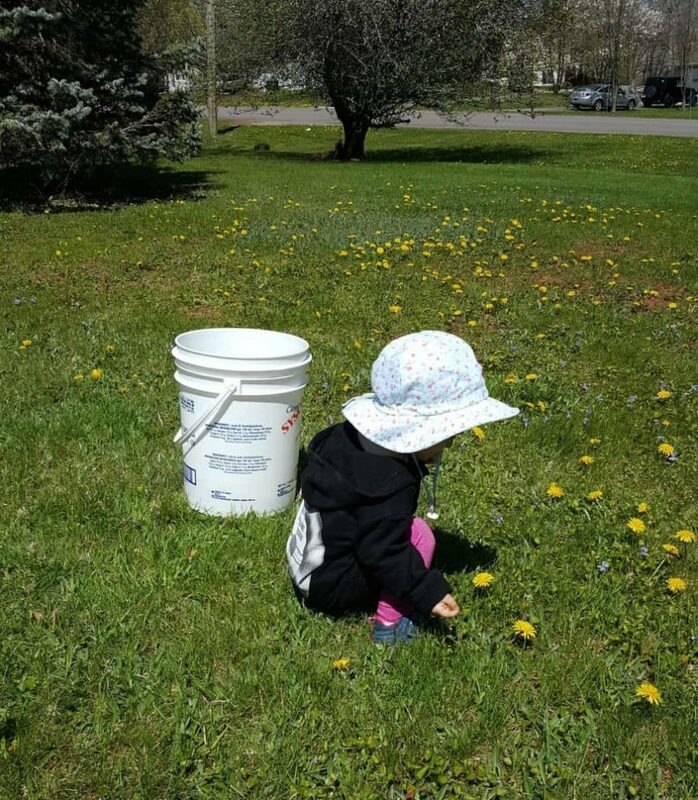 And yes, picking the dandelions takes a while, so recruit, your friends, and family to help! I got my 2 year old daughter to help me and she loved playing with the flowers! It took me about an hour to pick 8 liters worth of flowers. Once the flower heads are picked, the fun really begins! As you may have noticed while foraging for the flowers, ants and other insects love the nectar and pollen these bright spring flowers hold. This is not a bad thing though, after all we want to share this tasty plant with the other creatures around us. By trimming and cleaning the flowers you can eliminate a lot of the insects before you get cooking. I let the flower heads sit in their bucket for an hour or two, after which point the flowers will naturally start to ‘close’. This makes the next step a lot easier. To use the dandelion flowers in recipes, its important to remove the green stem and flower head base, and use just the petals. The base of the flower head contains latex, a bitter milky liquid, which is quite un-pleasent. It also stinks while cooking, and you don’t want that bitterness to ruin the light floral flavor. Simply take scissors and cut the petals of at the base. You will most likely get a little green in with it (the part that closes over the petals) but I have found this doesn’t contribute much bitterness to the final product. This part is the most tedious and its best to do it with a group of people! Recruit your family to help you out! Again my method here differs from other recipes in that I soak the dandelion petals in cold water for 2 days first. This helps extract some of the pollen and flavor and at the same time will send any insects scurrying. After the flower petals have soaked, dump the whole mixture into a large pot and bring the flower petals to a boil. Simmer the dandelion petals for about 20 minutes to fully extract all the flavor. It will kind of smell like boiled spinach as the petals simmer! Periodically stir the petals to ensure they are cooking evenly and all parts get their color extracted. After cooking, the liquid will be a dark golden color. Strain the petals out through a fine mesh strainer or cheesecloth, to remove any sediment and plant matter. I always like to draw off a little of the liquid and check the color. It should be a nice golden yellow! Add the strained dandelion extract back to the pot, add the sugar, then bring it back to a boil. Once the dandelion extract and sugar are boiling ,note the water level on the side of the pot (roughly). Reduce the liquid by half to thicken the syrup and intensify it’s flavor. 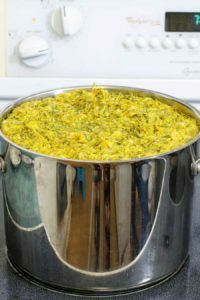 The dandelion syrup will take an hour or two to cook down over medium heat, and it’s ok to let it simmer away at first. Once you notice the syrup having reduced by about half, it will start to bubble on the surface as less and less water is present, and the sugar content starts to increase. Make sure to watch the pot at this point to avoid it from bubbling over and burning! 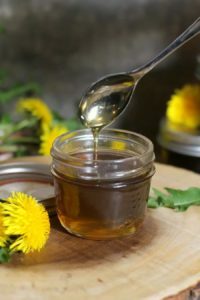 To test the dandelion syrups consistency, spoon out a little of the syrup into a dish and cool it in the fridge to get a sense of it’s true thickness. The hot the syrup will still seem quite thin. It will be very dark in color and you may think something is wrong. Hold up a glass if it to the light though, you’ll be surprised by its bright golden color!! 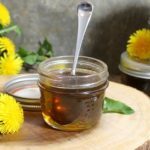 Use a heat proof funnel to pour the hot dandelion syrup into glass bottles or jars. If you use mason jars, you can boil the lids first before sealing the hot dandelion syrup in the jars. As the jars cool, they will naturally seal and you will hear the lids ‘pop’ as lid seals itself. 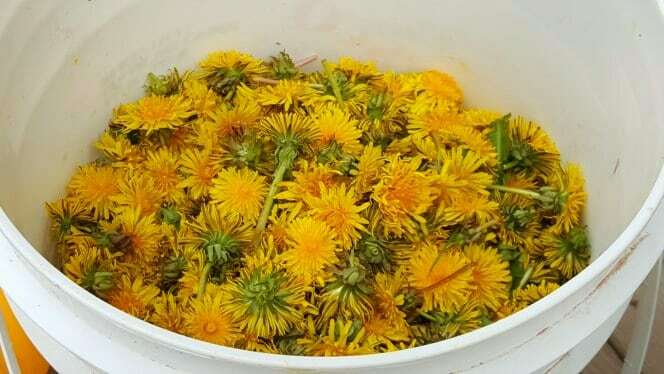 Try your hand at foraging with this dandelion syrup recipe. Great on pancakes, waffles, and in tea, this is something you won't find in store! Pick fully mature dandelion flowers while in bloom. It took me about an hour to pick 8 liters worth of flowers. Let the picked flower head sit in a bucket until the flowers 'close'. Take scissors and cut the petals of at the base. Discard the green plant, but save the bright yellow petals. You will most likely get a little green in with it (the part that closes over the petals) but I have found this doesn't contribute much bitterness to the final product. Soak the dandelion petals in the cold water for 2 days. Dump the whole mixture into a large pot and bring the flower petals to a boil. Simmer the dandelion petals for about 20 minutes to fully extract all the flavor. Periodically stir the petals to ensure they are cooking evenly and all parts get their color extracted. Strain the petals out through a fine mesh strainer or cheesecloth, to remove any sediment and plant matter. Once the dandelion extract and sugar are boiling ,note the water level on the side of the pot (roughly). Reduce the liquid by half to thicken the syrup and intensify it's flavor. Once you notice the syrup having reduced by about half, it will start to bubble on the surface as less and less water is present. Watch the pot at this point to avoid it from bubbling over and burning. 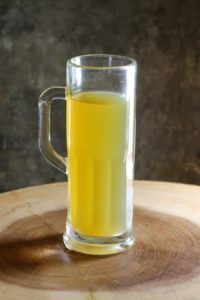 Test the dandelion syrups consistency, by spooning out a little of the syrup into a dish and cooling it in the fridge. Use a heat proof funnel to pour the hot dandelion syrup into glass bottles or jars. The base of the flower head contains latax, a bitter milky liquid, which is quite un-pleasent. As Such its important to remove the green stem and flower head base, and use just the petals.